Ice from Female Seeds is a feminised cannabis strain which is originated from the mix of two well known and powerful cannabis strains, namely the Skunk Special X White Widow. She won the first reward at the High Times Cannabis Cup in 1998 for the highest measured THC content at the ICE strains. Female Seeds Ice weedplants are best suited for indoor growing. However the cannabis seeds are also suitable for outdoor growing in the areas surrounding the Mediterranean Sea. This cannabis strain is resistant for higher temperatures. You can grow these cannabis seeds as Medical Marijuana, but the exact effect of this Medical Marijuana is unknown for us. The taste of smoking this weed is a clear strong diesel flavor. This flavor is especially popular in the United States. Growing weed out of these feminised cannabis seeds delivers you a prize winning cannabis strain with her very popular parents. 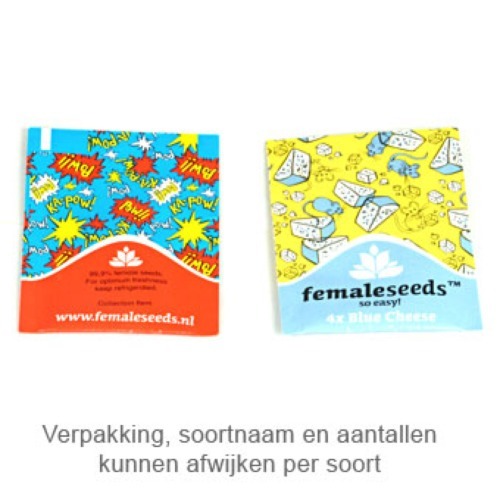 Tell us and our customers what you think of the Ice from Female Seeds.